For all of you that were there, thank you and I hope this triggers some great memories of an amazing day. Thanks to Carla Bohnett, Dawn Nakashima, and Joe Carrow for the photos of the day’s events. 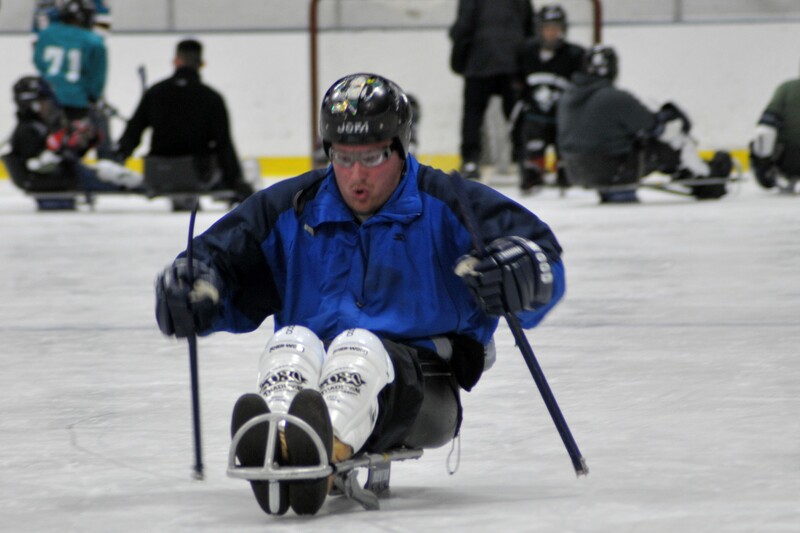 Also, BORP was mentioned in the Sharks website article on the Rookies visiting Oakland Ice Center and skating with some of the Sled Hockey athletes. It is a great time to be part of a BORP program! Posted by BORP on Behalf of Teamcraven. Teamcraven will be posting regularly about Sam, member of the U.S. Paralympic Team for Track and Field, as he trains for the 2011 IPC Athletics World Championships. We’re looking forward to keeping up with Sam. Thanks Teamcraven! Ron and I were working in Television in Denver, Colorado, when we met. We have three boys, Matt, Brad and Sam. Sam was born July 17, 1986. (Matt was 12 and Brad was 4) At the age of 13 months he received a diagnosis of Cerebral Palsy. We eventually learned the cause, after months of MRI’s and evaluations. The part of his brain that communicates between the two hemispheres, the Corpus Callosum, was not fully developed. We were devastated. We moved to California in 1991 and began talking to neurologists and Shriners Hospital for Children (then in San Francisco). Sam was to have a Dorsal Rhyzotomy, where about 30% of the nerves in his spinal cord that were causing his legs to scissor would be cut. UCSF was the best place. Therapy at Shriners was highly recommended. Shortly after moving to California, Sam began receiving Physical and Occupational Therapy at California Children’s Services in Concord, California. His OT noticed he was frustrated by his disabilities and was somewhat depressed. She recommended we get him involved with BORP. 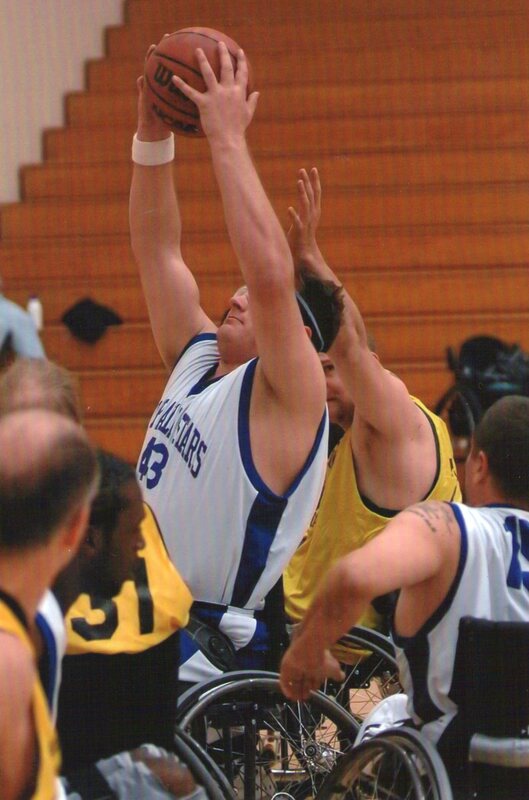 At age 5, Sam started playing wheelchair basketball on the Prep Team. He was thrilled with “going fast”. After the surgery in 1993, basketball (and BORP) helped him recover both mentally and physically. Over the years, Sam enjoyed playing in Prep, Junior Varsity and even a Varsity game or two. All along the way, we worked with him on his daily living skills with BORP sports, trips, coaches and teammates as incentives. He was MVP when the Junior Varsity won back to back National Championships but the most valuable piece was his growing independence. 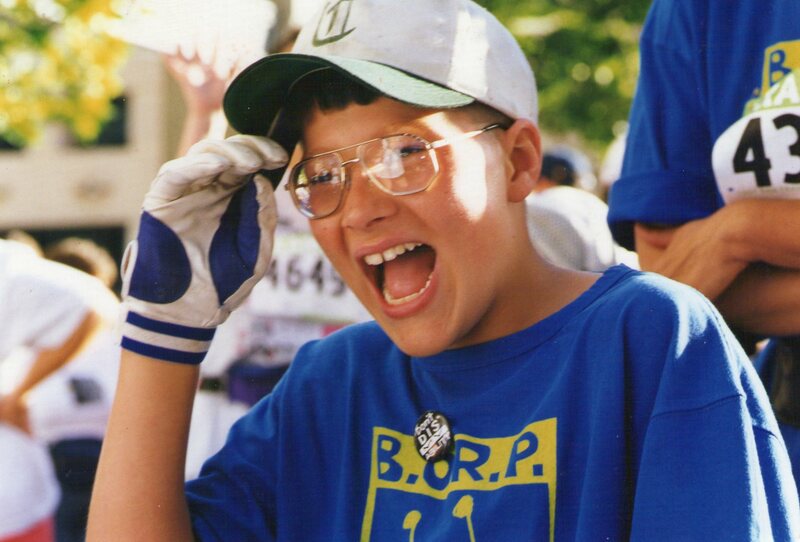 Sam was able to participate on his middle school track and field team and went on to become a member of his high school field squad but BORP really allowed Sam to excel in track and field. With a throwing chair made from a backwards bar stool, he travelled with the team to New Jersey in 2001 and helped win the large team award with gold medals in swimming and field. The next year he won golds in swimming, track and field, rolling around the track to beat a former Paralympian, Chris Ridgeway, in the 100 meter. When he went to Australia in 2005 with Team USA, he was swimming, lifting weights, rolling track in the 100 and 200 meters and throwing the shot, discus and javelin. Sports were an incentive for Sam to develop daily living skills. Because of his disability, motor planning and memory are difficult and so dressing and adhering to a schedule were a problem. On a trip with BORP, he had to get down to the lobby by a certain time, order food, interact and keep up with the group. One of us went on the trips but we needed to help all the kids so Sam had to keep up and do a lot on his own. He is living in his own apartment at the back of our house and is currently at the Paralympic Training Camp in Chula Vista, California (September 21-28, 2010). He still needs some help with schedules and gets a good meal or two at the “main house”, but Sam has come a long way and much of his progress is because BORP provided the incentives we needed to encourage him at home. In Sled Hockey, any day on the ice is a good day. 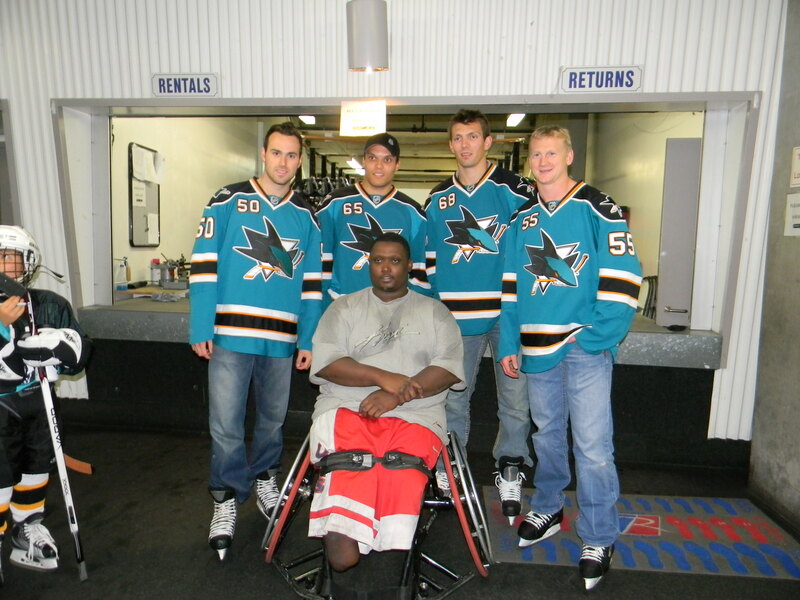 It is an amazing day when you get out there and get to skate with members of the San Jose Sharks. 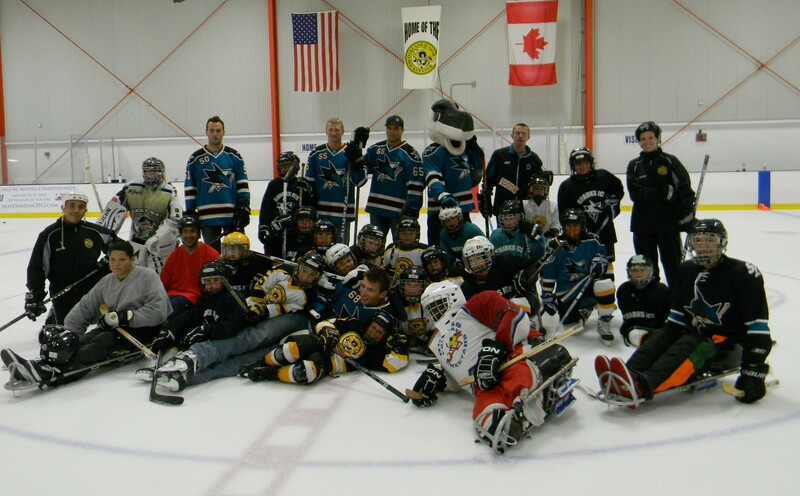 The Sharks skated with the kids from the youth hockey program at Oakland Ice Center and members of BORP’s Sled Hockey Program. Sharkie was also on hand to skate around with everyone. I gotta say, this was awesome. 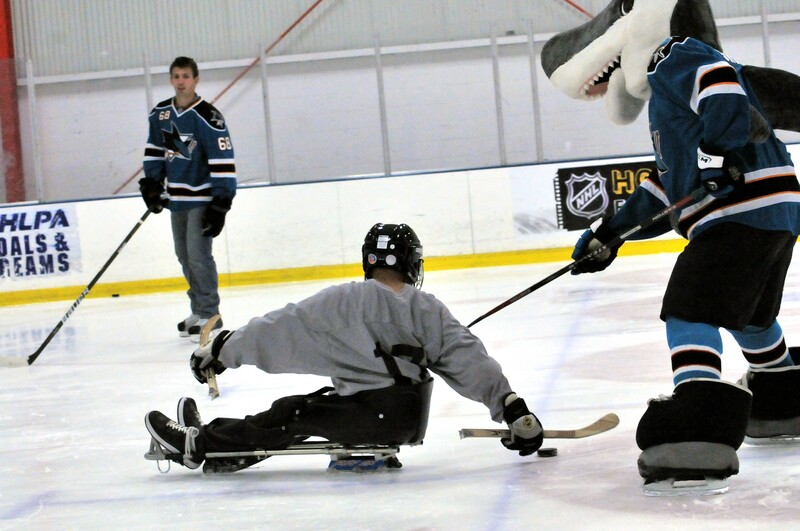 The Sharks were passing pucks and we were taking shots on one of the youth goalies and it was a blast. Afterwards, they stuck around to sign autographs for the kids. Marcus threw kids out of the way to get up there for a photo. We have Sled Hockey practice every Sunday. See you on the ice! Hey, tandemists. Last Saturday we had our first tandem ride up Mt. Diablo. Everybody made it up to the Junction Ranger Station at 2000ft, including first time rider, Sergio Lopez. That’s an outstanding first ride, for sure. Karla Gilbride and her pilot, Ginger Jui, kept on climbing another 600 vertical feet. Thanks to everyone for a successful ride, include pilots on half-bikes, Fil, Martin, and Amory. Next scheduled ride is The Revolution! See you all there. I just came home after an exciting night of goal ball action. With ten players in attendance (and three young women new to the sport who came to observe), there were two three-person teams and one four-person team rotating through several scrimmages (only three players can be on the court at one time). The games were fast and furious, with throwers slinging the ball bowling-style across the court and defenders attempting to block it with their bodies before it crossed the goal line. All players must wear ski goggles covered with tape to obscure any vision they have, and the ball (which is slightly larger and heavier than a basketball) has bells in it so that players can hear it approaching. Lines on the court marked by ropes taped down to the floor also help with orientation. Everyone that knows BORP knows Sam. From the little 7-year old that rolled in the Bay-to-Breakers to the mountain of a man that everyone simply calls “Big Sam”. He has participated in everything BORP has to offer, past and present. He helped lead the Bay Cruisers to two JV National Championships, one with a broken nose. He has been a crash test dummy on the basketball court and has broken more frames than anyone I know. On weekends when he has time you can still find him in the gym helping out with the Prep Team. Recently he has been a little busy. He has been training, attending camps, and training some more with the US National Track & Field Team. He has perfected his technique in the Shot put and is one of the top throwers in the country. We are all excited to say that Sam Craven has just qualified for the US Paralympic Team for Track & Field. 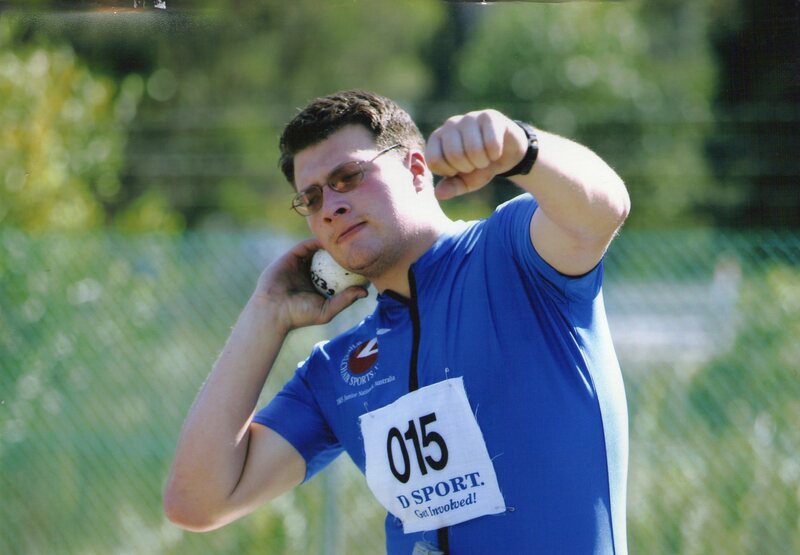 He will be competing in the 2011 IPC Athletics World Championships in Christchurch, New Zealand, January 21-30, 2011. Congratulations goes out to the entire Craven family because we all know that behind every great athlete is a great group of people who get you to practice, patch you back up, dust you off, and help you become the best you can be. From all of us at BORP – Congratulations Sam! Opening Day 2010 is here! Opening Day is finally here this weekend. What a great way to start off the new season and build from where we left off last year. This season the Bay Cruisers Prep team will be defending the National Championship. The Varsity team had a rebuilding season last year and now they are back on track. Over the summer the kids worked their butts off with an aggressive cross-training program to get ready for the season. I started thinking about new challenges for the kids. I wanted something that would keep them motivated through the summer, keep them involved with our already scheduled programs, and be challenging enough that it would actually take some work to accomplish. I also wanted it to be something measurable so we could repeat the task in the future and see if we are able to improve. played over 30 hours of Sled Hockey. All totaled the kids in the BORP Youth Sports Program burned approximately 239900 calories. That’s not all.. We finished off the summer with our 2nd annual Truck Pull. This is designed to let the kids see how much power they really do have and also of an exercise on teamwork. The kids team up and pull a truck across a basketball court. You can see the Truck Pull here This has been one of my favorite events because the kids that do it get to go to school and when people ask them what they did last week they can say, “I pulled a truck. What did you do”? That is pretty awesome. So, as you can see, the kids are ready, we are ready, and like I said earlier, Opening Day is this weekend. Come on out and be part of the best program on earth. Any Athlete, Any Ability, Any Sport. Recently Jonathan Newman, our Adult Programming Coordinator, emailed all of us a link to the Blind Soccer World Cup. For Blind Soccer Stars, Field of Vision is Overrated. As I watched the video I was enthralled and amazed by the accuracy of the kicks, and the inability of a sighted goalie to stop the visually impaired soccer player from scoring. As the kicker moved smoothly down the field manipulating the spinning movement of the ball with light taps of his feet, the keeper attempted to track the ball and the kicker. But tracking and stopping are two different things, and in this case a goal was the outcome. GOOOOOAAAALLLLL! What is it about watching this that makes me think, “How do they do that?” You see it happening, and when it’s done you don’t understand how it happened. Maybe it’s not important how, but more important that it happens at all. The fact that there are individuals out there that continue to move in a forward direction is what matters and what inspires. Individuals that do not stop because of a disability or a circumstance or a situation can be inspiring. Their athleticism is a glimpse of what is possible at any level. As an athlete myself I am inspired by other athletes, any athletes, any ability, engaging in any sport.